Congratulations to "Maureen C", the winner in Alison's giveaway. Thank you to all who participated! What if Laurie had had a cell phone? First of all, Miss Curtis and her friend would have been texting each other all night. I’m sure Annie would have sent out a quick: OMG, dude with mask. So not cool. Oh no, he slashed BF. HELP! (Since I am an adult and not a teenager, I’m sure my text only remotely resembles that of a current teen. )Then Laurie could have called the police. The police would have arrived in time to save the day. End of story. But having Laurie run back to the house, realize she forgot her keys, wake Tommy, discover the phone is dead…and eventually stab Michael Myers with a knitting needle was way more suspenseful. In my earlier attempts at fiction, I found I had to adjust my scenes to account for the obvious use of cell phones. I remember having my heroine trapped in a basement and my critique partner asked, “Why not use her cell phone?” Oh yeah, I forget she had it on her. Bummer. There are ways to work around this, as long as a writer sets it up beforehand. For example, a character can be out of cell phone range. (I imagine as we move swiftly into the future, this will get harder and harder to do.) Or a writer can set it up so the heroine left her cell phone behind. Wow, today of all days when the creepy guy with a mask is after me! Bummer! When I read older books from say, the 80s and 90s, it’s obvious how different things were before cell phones. Consider how many times the hero had to search for a pay phone. Or perhaps the heroine was traveling a dark stretch of road alone, at night, with someone following her. The scene would be written differently depending on if she was completely isolated or if she had an opportunity to call someone for help. 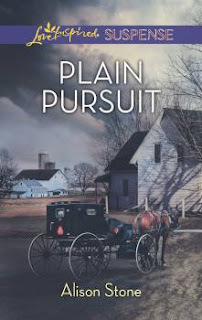 In my latest release, Plain Pursuit, my heroine is staying at the home of an Amish family. I conveniently located the farm out of cell phone range. Only the neighbors have a phone in case of emergency. Without giving too much away, the cell phone can also play another interesting part in suspense novels: individuals can be tracked using a phone’s GPS. The use of technology is shaping our world which in turn, shapes our fiction. Can you recall other ways the use of cell phones or other new technology has changed the suspense genre? I’d love to hear from you. One random person who comments will receive a digital copy of Plain Pursuit from either Amazon or Barnes and Noble. BIO: Alison Stone left snowy Buffalo, New York and headed a thousand miles south to earn an industrial engineering degree at Georgia Tech in Hotlanta. Go Yellow Jackets! She loved the South, but true love brought her back North. Giveaway ends 11:59pm EST June 18th. Please supply your email in the post. You may use spaces or full text for security. (ex. jsmith at gmail dot com) If you do not wish to supply your email, or have trouble posting, please email maureen@justromanticsuspense.com with a subject title of JRS GIVEAWAY to be entered in the current giveaway. Thank you so much for sharing with us today Alison. I am liking the sound of your book Plain Pursuit. I am amazed by how much technology is in our lives... I went on vacation a few years ago and felt lost without my computer... all you see around you are people with cell phones in hand, kids with handheld game systems, laptops in food places, even TVs placed in a good number of fast food restaurants... we would go into culture shock living the Amish way. Thanks for stopping by, Colleen. I agree with you. When I'm out, I also notice how everyone is engaged with their smartphones instead of each other. I make a conscious effort to put mine away and chat with those in front of me. Wouldn't it be nice, thought, to be unplugged for a few days? I remember books that had the bad guy cutting the phone wire. Nowadays it seems that in suspense the cell phones might not have service or the battery could die. I think this is all pretty believable since it happens to everyone at some point. I don't own a mobile phone, so right there, I could not call for help. Note to self - get a mobile phone. Not really, I just don't need one. The age of the characters would play a big part. That's a great point, Mary. Now when I look back, I find that I'm more dependent on technologies than before. When I finally had my own home (and cable TV), my dad would come over and be in awe of how "clear my stations came in." Oh yes, I forgot about that. I think you're right ~ an operator would come on. Thanks for stopping by. Excellent ideas. Love the idea of someone hiding from the bad guy and their cell phone goes off. Hi Alison. Got me thinking how anything can be overcome with the right amount of foreshadowing (is that the right term?). Was thinking about What Lies Beneath and how they set it up a head of time that the cell phone didn't get service until you reached a certain point on the bridge--it added to the suspense as they were busy watching those bars and... bam. Hmmm. I really need to watch that again! Great post, Thanks! Foreshadowing is the perfect term. And it adds to the suspense. Great example. Thanks for popping by.